The Magic of JillyJazz Kids begins our next eight week session on Friday, November 9th. 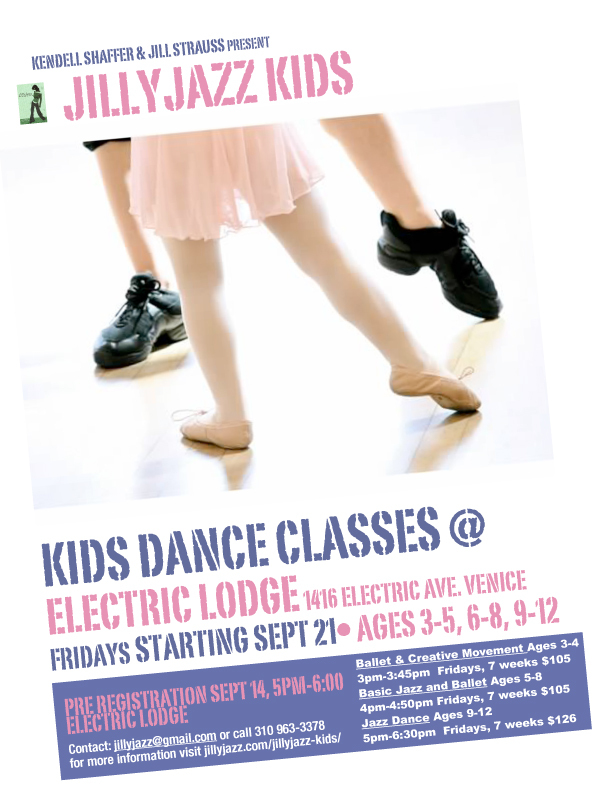 Check jillyjazz.com, click jillyjazz kids for all registration info or email us at jillyjazz@gmail.com. Ballet, jazz and creative movement for the little ones, ages 3 – 12. August Schedule – Fall Session!! All classes will be running on schedule until Thursday, August 23rd. We will close from Monday, August 26th until Tuesday, September 4th, day after Labor Day!! Take look at our 2012 JillyJazz Kids Fall schedule below. Check website for all the upcoming JillyJazz Kids info!!!! Dancers, we will be dancing on Monday, May 28th, celebrating Memorial Day. 11:00 Electric Lodge 1416 Electric Avenue, Venice. Come on down. We will have a jazz blast!!!! The New Kids In Town………. JillyJazz is offering two great Five Week Sessions beginning in June for kids. Check jillyjazz.com, click on JillyJazz Kids and Workshops and Events for all the exciting info. We will be offering Ballet, Jazz, and Tap. One Five Weeks Session on Fridays in Venice and one Five Week Session on Sundays in Santa Monica.